Candice and Jurij live in Toronto with their children Piper and Beck. Even though she’s a designer and married to a builder, she admits they don’t live in a perfect house. In fact, it often ends up last on their to-do list. She says all she wanted for Christmas one year was a simple baseboard molding in the dining room — but she still didn’t get it! After graduation, she moved to Toronto to attend the School of Design at Ryerson University, and then got a job as a commercial designer. That’s where she says she learned the importance of good lighting. Olson worked at several design firms before starting her own in 1994. In the early ’90s she appeared on a local morning show in Toronto to talk about decorating. She was such a hit, she became a regular for 9 years. In 2003, HGTV came knocking. Q: What should people get rid of? A: Fussy draperies. They’re like a showgirl sitting in the middle of the room. They can really date a room. Windows should be clean and simple. A big monstrosity of a TV cabinet with the television concealed behind doors. Get over it, Honey, TV is here to stay. Q: What are the biggest design mistakes people make? A: People used to be so concerned about their style: traditional, modern. In the ’80s and ’90s people pigeonholed themselves. Now they’re exposed to what’s going on in the design world, and they want a mix. There’s a trend toward more eclectic rooms. Q: What’s your favorite countertop surface? A: Seventy-five percent of what I do is quartz.I love the practicality: the consistency of color, no seaming, no staining. Q: What is your house like? A: It’s a very simple 1950s modern house in Toronto, about 4,000 square feet. Our kids ride tricycles inside the house. It’s on a golf course (we don’t belong to the club) with a great view. The back of the house is glass. I’m bombarded with design and color day after day and I design every single day. I wanted someone else, Mother Nature, to design this house. The house is all about what’s outside. I never get to bed before 2 a.m., the kids get up at 6 a.m., I’m a working mom, and we’re a typical family, trying to juggle the kids, being a good wife. Our house is lived-in and comfortable. They only shoot 26 shows a year for “Divine Design,” and they only work in the Toronto area. The clients, not HGTV, pay Olson for the makeovers. Some run over $100,000. She believes it’s important to take their time with a remodeling project and to do it right. She also publishes books about design. 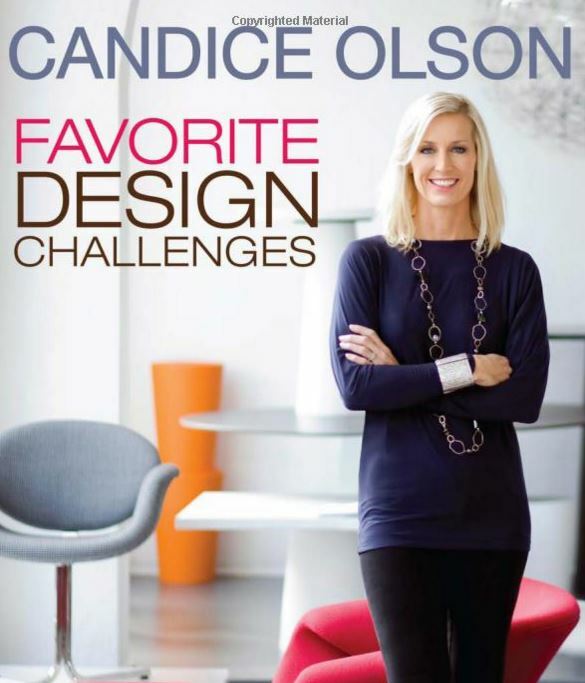 Some of her popular titles include Everyday Elegance, Family Spaces, and Favorite Design Challenges. What Do You Think About HGTV's Green Home 2010? Love her! I have her book and think she is just so funny! I’d love to meet her. My mom and I have been huge fans of hers since we first saw her on HGTV years ago. My mom is really picky about her house – she says of all the designers she has seen, Candice is the only one who could work on her house and she could have free reign to overhaul everything. That says a lot! .-= Sarah @ Dream In Domestic´s last blog ..Creating a Home Through Garage Saling =-. Yes, as a fellow Canadian, have always admired her work and remember her from her Cityline days (daily talk show that still runs here.) Her rooms are layered with lots of detail, colour and textures. I love how she always shows her renderings too. I’m a big Sarah Richardson fan though and just did a post on her antique finds. .-= Vanessa´s last blog ..Meg Ryan’s Home in Elle Decor =-. .-= Trish @TheOldPostRoad´s last blog ..Can You Even Imagine? =-. Candice is a bit of all right herself too, isn’t she? But she always is practical, in with the talent. I think she should allow herself a little more sleep though! Julia, I love your investigative pieces! I bet you could find out ANYTHING if you set your mind to it. .-= Tricia Rose´s last blog ..Role Model =-. I love Candace Olsen, she is a great designer. The other designers on HGTV, I don’t care for that much because most of them don’t have good taste. .-= Kristin´s last blog ..A Page Of Inspiration GIVEAWAY =-. I agree completely, she’s my design role model. She’s never done a room I haven’t liked! I also did a post on her fabulous skills on my blog too at https://recklessbliss.blogspot.com/2009/12/candice-olson-rocks-my-socks.html. Great post Julia! .-= Heidi@recklessbliss´s last blog ..Homemade Cupcake Birthday Card =-. OHHH! I love her! Her style is impeccible – and her show is funny, too! .-= Gina @ The Shabby Chic Cottage´s last blog ..Guest Post: Amanda at Serenity Now =-. I loved this article! And, I can’t tell you how much better it makes me feel to know she can’t even get her dining room baseboards finished. .-= Emily A. Clark´s last blog ..A Beautiful Kitchen Color Combo =-. Thanks, Julia. Love her show and she is a very talented designer. .-= Robin´s last blog ..Famous Couples Friday =-. I absolutely adore Candice Olsen. My other fav by far is David Bromsted. His Color Splash was awesome. I love all the custom paintings he did for his clients. Great post Julia…very informative. I did wonder all about her. Now I can put those burning questions to rest:) Have a great weekend. .-= Becky @ Farmgirl Paints´s last blog ..Create your own Sunshine! =-. HGTV better keep her around…whatever it takes. I’m not certain, but it seems like trained designers, professional designers, are becoming more and more rare on that channel. They seem to have replaced designers with TV personalities…a big mistake. If someone can’t draw or do a rendering, they belong on the DIY network, not on HGTV. I love her, though. She is refreshingly normal in her interviews, isn’t she? .-= Jeannine @ Small and Chic´s last blog ..Cville Design House shuttle logistics =-. I agree! I use to be glued to HGTV because of “so many” design shows. Now? I DVR the “few” design shows I can find (far and few between). It appears HGTV has turned their decorating show into a “real estate” show … very disappointing especially in an economy where houses aren’t selling! What gives HGTV??? FYI ~ Many former viewers share the same thoughts. I totally agree. What’s up with so many real estate shows? Let’s get back to design! Candice, Sarah Richardson and my new Canadian favorite Mike Holmes from Holmes on Holmes. What is with all the Canadians, I love you all!!!!!! You must check out Mike he is soooooo… HOT!!!! I love a man that is smart and sensitive. They are all so talented. I love Candice Olsen’s work. I would have no trouble turning my house over to her and letting her have free reign to make it over. How nice to read her interview. I like most of her designs, sometimes it gets a little to modern for me, but over all, she is terriffic. That gal can wear a necklace a tank top and a pair of jeans and look like a model! It seems that HGTV features a lot of Canadian talent, is it based in Canada? .-= Pat´s last blog ..Goodnight, John-Boy & Other Large Families =-. I finally got me two questions answered: 1) Is she singing the theme song and 2) Do the clients pay her for her services, or is it free? Thank you, thank you! .-= Kelli´s last blog ..Tuesday Truth #11 – I harbor illogical guilt =-. I love Divine Design. If I had to pick a style I’d say it would be ‘Candice style’. Her rooms are gorgeous! I kinda figured that people were paying for their remodels. Thanks for the great article Julia! I love Candice and Divine Design is my favorite show. .-= Candy @ SoBella Creations´s last blog ..Giveaway Round Up! =-. OOOHHH yes! I LOVE her stuff… I mean, her designs are me (if I had that kind of money) 100%. I could just sit and drool at the rooms she produces, and I tell you, if I lived in Toronto, I would sell everything I had just to pay for a design by her, lol. I’m definitely a fan…thank you so much for all the inside information! She seems very down-to-earth. Seh has really grown on me over the years. Definitely not a “budget” designer, which is more my field of specialty, but she’s always inspiring and I always like the end results. Thanks so much Julia!! .-= Courtney @ Nesting Instincts´s last blog ..Friday’s Fabulous Finds: pretty things =-. I too have always loved her work and I like to take inspiration from her, but have always wondered about her personal life and never found the information about her included in your post! Thanks so much, Julia, you have done it again! .-= clustres´s last blog ..Before and After – Frenchy Stuff Meets Restoration Hardware =-. It’s very rare that I don’t love something Candice does! The one major thing I’ve learned from her is how important lighting is!! When they show the before and transform into the after, the lighting is always the thing that catches my eye. My Idea Folder has a lot of Candice’s work in it, and she’d probably be VERY happy to know that I don’t have a single kitchen idea! I would like to live in that sleek white kitchen! Because the look of my bloody kitchen is aging me 10 years. Wait, the dishwasher broke last week, make that 15 years. .-= hip hip gin gin´s last blog ..Tulle Time =-. Thanks for a great post! Candice Olson is a favorite of mine. I like her because she unifies style, form and function with a bit of bling. Sarah Richardson is a favorite of mine as well, and hope you post about her one day. .-= Susan´s last blog ..Shopping Trip =-. .-= LOVE WHERE YOU LIVE´s last blog ..Fabulous GiveAway!! In Celebration of My New Blog Design & Spring. =-. Thank you, Julia. Although I’m a huge fan of Candice, I never knew anything about her. The only thing I was aware of was her two children because of her pregnancies on the show. I can see why her kitchen designs age her as they are “uber” designed! She’s obviously a perfectionist because she consistently hits it out of the ball park every time! This was an enlightening post. Thanks again! I adore Candice not only for her spot on designs, but for her humor on the show. Nobody does lighting and wall treatments like Candice ! I didn’t realize she worked only in the Toronto area, but that makes perfect sense since she’s a busy and talented mom ! Although I’m not sure I’d call a 4,000 square foot home ‘simple’ LOL. .-= Kate at Centsational Girl´s last blog ..Going for Gold =-. Thank you, Julia! Candice is my absolute favorite and I too,would let her loose in my house and not question a thing! While I love her work, I have always wondered why she doesn’t mix a few antiques in more often; it seems most of her furniture choices are new. As an avid collector of Japanese antiques, especially tansus, which can be used very effectively with modern interiors, I was shocked one time to see her take a step tansu out of a house! It disappeared without a trace! But maybe I am too focused on keeping treasures and working around them since the ultimate result, was, as usual, gorgeous! Thank you for posting this! She is one of my fav designers! She’s sorta goofy on her show and I think that is why I really just love her! She’s real! .-= Reynie (SouthernGirlRambling)´s last blog ..Favorite Children’s Books =-. Oh, yeah! She’s my favorite. Thanks for the lowdown, Julia. One of the things I really like about her work is the layers of design — she doesn’t just set the stage, she completely furnishes a room in detail. I’m not surprised that she’s never had an unhappy client and I’m not surprised at the costs because, as I said, her designs are multi-layered, full-throaty works that really work for me. Just found your site today through another local website in NC! I love it and I am hooked already! She’s such a funny lady. My mom adores her and although I can’t say I love everything she does, I did watch the show because of the comedy aspect. .-= rue´s last blog ..What I’ve learned =-. I am a fan! What a great interview ~ thank you for posting it. It was great to learn more about her, since all I really see is what she does on the show. I’m not that familiar with her, but judging by the pics here, her rooms look very designed. A more casual elegance appeals to me. .-= Lori-Anne´s last blog ..We’ve Moved =-. I like Candice’s designs, but if I had to choose between her and Sarah Richardson’s designs in my home, I would definitely choose Sarah as she seems to respect vintage pieces and that’s what I like. But if I had my choice of any designer, it would be Miles Redd. Shw is my favorite! I would absolutely be happy, happy if I could EVER afford her! Her rooms are brilliant! Love, love, love Candace. I used to think her aesthetic was too contemporary for me but lately it seems like her work is more transitional or eclectic. I like all the luxurious textiles she uses too. Still, my very favorite designer is Sarah Richardson, from Design Inc. and Sarah’s House, who’s also a Canadian designer. Her work is impecable and she is a stellar problem solver who can meet any design challenge. Both of these designers have great personality and T.V. presense which is what makes their shows so interesting. That was great! I do love her rooms and it’s nice to get to know the person behind the design. Thank You! .-= the domestic fringe´s last blog ..In This Age of Entitlement =-. I wish one of her Q&A’s identified that fabulous necklace she’s wearing. .-= Bromeliad´s last blog ..It was a wicked and a wild wind =-. I love Candace, but I love Sarah Richardson more! .-= Jenny´s last blog ..Currently =-. I would describe Candace’s style as “feminine” contemporary. It’s clean and simple, but it’s still cozy and warm. She is the only designer I have seen who I would trust to take my house and do with it what she wished. I love everything she does. Love her! She is so funny too – I love it when they do their quirky little jokes they film! Great post! .-= Jess @ Frugal with a Flourish´s last blog ..A Retro Birthday Present =-. I also love every room Candice has done. She was my favorite until I got “hooked” on Sarah Richardson of Sarah’s House-please do a post on her someday as well. Canada must be full of great design! I LOVED this post!!! She’s like the Godmother for most of us. ; ) The images you selected were from some of my favorite episodes. I have the book and wish she would have included some instructions on where to find some of the pieces. Ha! .-= the Blah Blah Blahger´s last blog ..TAP TAP TAP, IS THIS THING ON? =-. Thanks, Julia! I’ve always wondered who paid for the room makeovers. I wonder if some of the other shows work the same way. Thank you so much for the article. I love her and she answered a lot of questions that I had. I have her tivoed and have about 6 shows to watch. She is fabulous. .-= Melanie´s last blog ..Wrinkled Ladies =-. .-= Rhoda @ Southern Hospitality´s last blog ..Cabbages & Roses Book Review & Giveaway =-. Enjoyed reading about Candace. How about doing something on Sarah Richardson? Thanks. .-= The Little Red Shop´s last blog ..Johnny’s Jump-Ups & Little Beau Peep… =-. Yes Julia Candice is my fave….she has honestly never done a room I didn’t like…she is such a doll too….and I LOVE Chico…..do you know what happened to the original carpenter…..he was such a hunk, loved him !!! I also LOVE David Bromstead(sp) maybe someday you could do a post on him ??? Love Sarah too and her sidekick is a hoot…., Whatever happened to Myles of Style ??? I have to admit I didn’t care for her…. Remember Room by Room they were cute miss them….Lynnette Jennings miss her too….I’ve loved HGTV for a long time….. Thanks for the tip off about House Hunters….that fake Suzanne Wong voice makes me crazy !!! PS Another show on HGTV that I LOVED…..and until recently I watched but can’t find now,,,,,is My House is Worth What ???? I second that motion…I like most of what Candice does, but sometimes it doesn’t seem attainable…Sarah Richardson on the other hand…LOVE, LOVE, LOVE. Great post!! I love Candice! I think I’ve learned more from her show than any other design show. I like that she doesn’t just tell you what she’s choosing: she also explains why she chose it & why it works. I also love Sarah Richardson: I’ve enjoyed each of her shows since Room by Room. The new show where she’s redoing the farmhouse is my favorite – I love to see how she transforms all those vintage finds!! .-= melissa*320 sycamore´s last blog ..caught my eye 5/28 =-. Does anyone know where to find pictures of all/most of Candice’s Divine Design rooms other than at her own website or at hgtv? I find those are too small, plus it takes SO LONG to look through every room. I found a site approx. 2 years ago where you could click through pictures very quickly (like you have them on display above, which is awesome!!) and see all of them in a flash. Anyone know????? Thanks! I love your website! I found it in my Candice Olson search and I’m very excited to go home tonight and explore the interesting links I see. Do you know where Candice Olson gets her media furniture from? I’m looking for the media center / bookcases that she uses to flank a fireplace (focal point). It looks like these cabinets are custom made, but I notice they arrive in boxes unassembled. I’ve checked the TV episode product listings and the source of these furniture pieces aren’t mentioned (at least on the episodes I’ve checked). I’d appreciate any resources or links you can refer me to. I’ve been trying to figure that out myself, and can’t find anything! I loved the cabinetry for the episode, “Mom and Dad master bedroom.” Hope someone can find out. Candace Olson’s designs are all starting to look the same. Elegant and beige. Does she do anything else? Elegant and beige is getting to be boring. All of her designs are looking identical! I don’t want to miss any of her show. If someday I could buy my own house, definitely I will hire her. Candice Olson is the best!!! I have watched Candice Olson for several years now and really enjoy her “sense of style”. I have noticed lately how refreshed her appearance looks she compared to earlier shows. I would appreciate any information on cosmetic surgery she has obtained. She looks fabulous. YES! I almost didn’t realize that it was her in one of the shots on Design Star! In comparing some online photos, it looks like she had some Juvederm/fill in the “parentheses” around her mouth and perhaps a slight “lift” of some sort. My whole house is a big mess i need lots of helpe please somebady from hgtv help me please! Her talent it’s admirable. I can only dream about her spectacular designs because, we can’t afford her. Thank you HGTV for asking her to host her own show and share with us her diving designs. thanks for a great post on her, really interesting stuff mate! .-= Annie@ A view on design´s last blog ..Hamilton Island- QLD =-. John and I both agree, we would love love LOVE for her to come decorate not just one, but our entire home. I truly can say honestly that I have never seen a room she has remodeled that I wouldn’t love to live in and with. Thanks for bringing this post back. Somehow I missed it when I was reading your back posts!! BTW, I am such an avid follower of yours, girl!!!! I love Candice. She is my hero so to speak, I have always been a want to be designer, but never had the confidence to persue my passion for Interior Design. I have been a huge fan of HGTV, Discovery Channel, and TLC design programs I would say for over the last 16 years. The first time that I had seen Candice’s show she did over a kitchen where the house was once lived in by college students, and wow did she change that kitchen, I was so impressed and hooked to her shows ever since. I love how she can take a room that looks hopeless and turns it into a dream room. She just is amazing to me. I also like how well she uses the spaces that she designs. If I ever due persue design it would be my dream to have her as my teacher. She’s wonderful and I haven’t seen a room I didn’t like of hers. Also love Sarah Richarson’s designs. Thanks for the info on Candace! .-= Teacup Lane´s last blog ..Stunning Alaska Blooms! =-. I absolutely love this woman! She is one of the best designers out there hands down!! .-= Mrs. R´s last blog ..Researching Getaways =-. Hi Julia, Hope you are enjoying your vacation. I am just catching up. I have always liked Candice Olsens rooms. There is one thing that makes me nuts about her designs though. She almost always incorporates a hanging chandelier in the middle of a room…either it is over the coffee table or the side tables. This gives the owner no option to rearrange! My family would be knocking into that thing left and right. Of course if we all had 20 ft ceilings…then that could work. I’m just adding my 2 cents today. .-= Black Eyed Susans Kitchen´s last blog ..NOSTALGIC INSPIRATION FOUND IN THE GARDEN =-. How do we contact Ms. Olsen about designing a room in our new home? We are about an hour from Toronto and would love to get Candice’s over to our place one day. Love the show, her entire team is so much fun. Glad she is so popular in the US. .-= Kinga´s last blog ..Simple storage – laundry room =-. Where does Candice get her cabinetry???? Love her!! Hellooo I am from Colombia – Bogota, and I`m a Huge fan of Candice and from Divine Desing!!!. I watch it every thursday here in Colombia and it`s incredible…I would like to contact Candice because on December 2010, I will be premiering new apartment with my husband, I`m just newlywed. I will love to recieve some advice from Candice on how to decorate my new & 1st apartment. So If by any chance I could contact candice by email or by posting a letter, please Let me now, I will be glad! Love, love,love Candice’s show. You are my favorite designer of all time. Just really miss the first crew you had on your shows. The interchange between all of you was so great, enjoyed them very much. Great work, wonderful redos, keep coming to HGTV. As a high-browed gay man with an eclectic, yet classic palette living on 89th and Central Park West, I normally gawk at some of the “designers” on HGTV, especially those who use the gay card in attempts of making the straight world believe their talent (or lack there of) is any more prevalent. Candice is the ONLY designer who I consistently agree with (95% of the time) and can still surprise and put a smile to my face. We watch your show all the time on HGTV. My son and daughter- in -law were married on November 15, 2010, almost one year ago. They stay with us over the summer (we live near the Jersey Shore). They just announced that they’re expecting a baby in June 2011. we are so excited and are looking forward to it. However, there is not much room to accomodate them. We have a fully furnished basement with one small bedroom and a very old bathroom. We were so hoping that you can come with your fabulous crew and help to make my daughter-in-law (Sarah) and son (Benjamin) (the cutest couple – she’s an artist) a very comfortable space for them and my new grandchild. It would mean so much to all of us and I think you would love working with us too. My husband will try to help (he breaks everything he touches), and my son doesn’t know anything about building. I will try to help and my daughter-in-law Sarah is a wiz, she can practically do anything and is a very willing student. So, please , come and visit us soon. Would love to meet you. I want to invite Candice to Australia, I love her style and would love her to help me style our new house to make it a home. If she wants I can send her a picture of our house. PLEASE PLEASE Candice come down under we need your help. I want to build the headboard from the HGTV.com, the minimalist bedroom with three panels. I can handle the tight grain ash and fabric panels, but is the shelving on the sides a kit from a hardware store? My borther lives in Toranto and his business is Steve and sons painting, I will have him pick up the kids and bring them home at christmas. Thanks for your help. I’m not sure what you’re talking about, Greg, or who Chelsey is, but okay! I am from Malta , an island in the Mediterranean sea. I really love Candice show. She is really an amazing and full of great ideas. Thanks for the article–Candace is fantastic–talented, beautiful and funny. I’d love to see her do a log house…..I miss some of the original cast–Edmund, Hunky Paul (who I thought she was married to…) Do you now where they are now? I like some of the other designers on HGTV, but Candace is in a class by herself….. I don’t know where they went. Does anyone else? Hi, Candice yes you are one of my favorite designers. We have a lot in common. I coach volleyball at my former high school and my daughter and I watch your show all the time. My family often ask me do I ever get tired of watching HGTV. My answer is No. I enjoy Divine Designs and Design Stars as well. If you are ever in the Atlanta area and would like to stop by and help me with a homemaker feel free. Again, your talents and keep up the great work! I just want to say I have watched Candice Olson since she was on City Line. Candice has been such a influence for me that now that my children are grown I have gone back to school (Sheridan College) to take interior decorating. I am loving it and getting ready to graduate in April 2011. My dream is to have a room done by Candice one day. Thank you for all of your insperation, I love her elevations and floor plans!!!! I hope one day to meet you Candice Olson. Candice is the ULTIMATE designer. There is no one that can touch her. I simply love the way she sees color, and gets into her client’s head. My friends and I joke that after she does a room for them, she has to do the rest of the house. I know I couldn’t stand the idea that the rest of my house looked like crap. I wish her centuries of success because her design are timeless!!! I need help with the designing of a new maybe eclectic kitchen for my 1950 home. The old pine cabinets are now painted yellow as the stain was so worn out that it wasn’t a pretty site. The white countertop has a few dents in it and never really fit flush against the wall. I wonder if a quartz counter top could accommodate my old but still loved double stainless steel sinks. I would love some input as to what kind of cabinets I should consider in this small kitchen with a straight line design. If you are still looking for someone that wants to be on your show to redesign a small kitchen please consider me. I also in Toronto in a small house only 900 sq.ft. Thank you. I too wonder about the old team!!! With the new show–are the team of Chico etc.no longer part of the show. The Canadian design are my favorites. Candice is the best==our U.S. shows do not fare as well. I like David Bromstads -old show =however his new show in Miami is onlydesigned for that area. It certainly doesn’t fit in MN where I live! Some women cry @ love stories. I always cry with your show. Your designes are over the top. Class A! I look around my house and cry. To afford one of your designes would be my dream. I watch your show alone because I don’t want my family to see me cry. I have a great husband and would not want to hurt him. He is a hard worker. But I do think it would hurt his feeling knowing how much I love your style and that we can not afford your designes. Your show means so much to me. Every time you make a reveal I pretend it’s my house. Writting this letter here at work I’m holding back the tears. People would think I’m crazy. LOL I just wanted to share with you how much you touch my heart and soul. Keep designing. Thanks for the cry. which you play a significant part. no project has been more important than the one I am tackling now. Late this past summer, Andrea began to experience a lot of pain and exhaustion. sleep. She was 37 years old. single man with 3 large rescue dogs and a lot of bittersweet memories. I picked up that idea from you or if somehow it was my own. statement of the project when it is complete. I am also an Interior Designer, and I love Candice’s work. HGTV and TLC typically showcase entry-level to mediocre (at best), “designers”…(remember Trading Spaces?)…UGH. Candice is a true professional, she knows her stuff and I have learned a lot from watching her rooms come together. She also has great interaction with her clients, doesn’t have cookie cutter, one-trick-pony design sense and she is perfect on TV, which also can’t be said for most of the designing shows these days. Wish I was in the Toronto area, I’d love to join their team! I would like to know where I can find that great wooden wall organizer with the hidden fold out hooks and shelves seen on several Divine Design episodes including “Boxed In”. I love both Candace and Sarah Richardson’s shows very much! Candace has never done a room I didn’t like. Sarah’s style is more to my liking, however, since I love antiques & vintage style decorating. Dear Candice : I hope you get to read this . You are just amazing.Your talent is incredable. On top of all that your personality is one to be proud of.I will watch your show forever just to maybe pickup on some of your ideas to add to my home.By the way if you and Chico want to tackle my unfinished basement I would be honoured. I am trying to find the traditional dining table used in one of Candice’s elegant dining room makeovers. The table has extensions on the ends of the table. I have searched and cannot find the episode that featured this table. Can anyone direct me to where I might be able to purhcase the wooden wall organiser with the hidden hooks featured in the ‘Cozy Gathering Spot’ episode making over a narrow space with a lounge and dining area. I’ve hunted everywhere and can’t even find an email address for the show to ask. So any assistance would be greatly appreciated. Thank goodness for this site or I would have hit a dead end!!! Candice Olson is the most talented interior decorator I have ever seen on HGTV. If I ever get to make enough money to afford her decorating services, and if she was still decorating by that time, I would be absolutely “wow-ed” to have her artistry in my house! You are so talented Candice, you are truly a genius! I’M IN LOVE w/ Candice’s designs – I’ve seen every single episode she’s in. Too bad I live in Los Angeles. I love her style – sophisticated, timeless, extremely practical, durable, and tasteful, all the while making the room look like a place where someone actually lives in, as opposed to a fancy showroom. Candice, if you ever come across this post (nearly impossible), I just want you to know that I’m seriously considering leaving sunny California for Toronto JUST to get you to design my home. Better yet, perhaps you should consider coming to LA! Candice has lost her sense of humor – she’s not as funny as she used to be. Where is her old crew? Her new show is taking some getting used to. I Miss the quirky energy … I was actually bored with her last show and didn’t stick around to see the final production. What happened to Chico?!!!! I loved Divine Design, even though Paul (the carpenter) and Edmond (the sewer) weren’y on it anymore, but to get rid of Chico, Candice, what is wrong with you??!! Divine Design was a better show and Chico rocked. Get him back!!!! I can’t express how much I’ve enjoyed being a part of Candice Olson’s journey through the years. And I am sure my kids are unable to count the times they have heard me say “when I grow up I am going to be just like Candice”. Did I mention I am 43? One thing is for sure, I have enjoyed every moment of Devine Design an their crew. You are a very bright light Candice, I hope you will continue to teach an intertain us for years to come. Candice Olsen is the best designer eva! her designs are Devine!!! I wish I could get a room designed by her, but since that is a wish, I just love to watch her show. Candice Olsen is fabulous, I have a small design stylist company and I have never seen anything she has done be anything but gorgous and always so creative! She truly is my hero. Does anyone know how to find a source list for items used in her designs? I fell in love with a canvas print that was in the last show she did for Candice Tells All and have no clue how to find it. It was the show with the small living/dining room combo and aired on 3/19/11 I think. Love her and love your site!! How to find a source list for fabrics and manufacturer sofa. I loved the fabric on the pillow and drapery “theatrical” curtain. I’ve enjoyed Divine Design since its debut on HGTV. It’s strange that HGTV doesn’t seem to be interested in releasing it’s shows on DVD, like Divine Design. I ask them about it only to get no response. Not good ! I know that there is the Candice Olson Kitchen and Bath DVD, but that has only about 4 episodes on it. That’s all, folks ! Does anybody out there know of the availability of the show on DVD ? Maybe through Candice herself (hint, hint …….). It’s a bummer to invest your time watching a series only for the network to stubbornly refuse to release it on DVD. They could even consider the DVD on Demand concept, where the product is made WHEN orders come in, avoiding mass production and distribution costs. Or make the seasons available via download. C’mon HGTV ! You need to be considerate of your fans. Candice, maybe you should put some fire under them ! I am a huge fan of Candice Olsen’s designs. My favorite designer and I’ve watched every show I can. Her designs really speak to me. I’m getting ready to move in the next year and I scour her designs that I may recreate as close as possible a living room and bedroom to die for. I love the show where she designed her Mom’s kitchen. I actually shed a tear to see the intimacy of their relationship. Wish I could afford her services!! Candice you are the best. 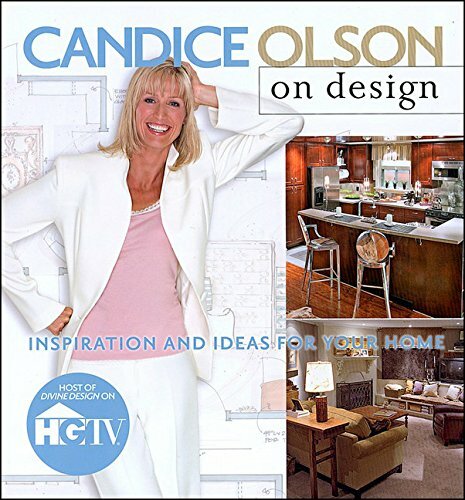 Candice Olson is by far the best designer, I have an obsession for designing and I began watching HGTV shows. Until I discovered Candice show on W network, I fell in love with every single one of her designs. I ensured that I watched all her episcopes and I was able to get my husband to watch Devine Design with me. My living room is not very functional, I am not sure how to design it and for the most part as a family we don’t utilize this space. After I graduated from University, get a job and save some money I would definitely hire Candice to design my living room so we can sit and watch television as a family. Her hubby is a doll. She is the ONLY designer I would hand my house keys to and say have at it! I would trust her with all. She is great…I just wished she started using other colors! Hi Julia,Thankyou for posting this article about Candice.I’ve watch her for a long time now.And yes I did notice a difference in her looks this time on her new show.We do have some wonderful designers here in Canada.Candice is one of my favorites. Legendary ! That’s one fair word I can used to describe my “Role model” ,Candice. Two years ago, on my first trip in the United States ,I had the remote control in my hands scrolling the chanels . I found something that warrants my attention on chanel 30, (Candice Olsen , Devine Design) .Ever since I’m in love with her show. I even think of having a tatoo of her . meeting her someday would be like meeting Jesus Christ in person. loooooooooooooooooooooooove her to death for inspiring me and helping me keep my eyes on my goal, which is of course become a home stager. Candice is really my favourite designer of all time. Following closely behind are Genevieve Gorder and Scott McGillivray. Even though I am all the way from Trinidad, I really enjoy looking at her on HGTV. Candice’s designs really are divine and inspiring. I love ALL her work. I am yet to see something from her that I don’t love. I have been dying to know what that black tablet looking this Candice Olson designs stuff on is. Do you know where I could find one? I’m wanting to go to college to become an Interior Decorator and I thought if I purchase this device I could design room really easily. So do you know where I could order one? Good question! I don’t know, but you might be able to get an answer from HGTV.com. Good luck! I wish she could come to Brazil… Lots of new ideas here! Moro no Brasil e adoro o trabalho da Candice, sempre que posso assisto Design Divino. Adoro os detalhes como ela mistura os objetos, as cores e graças ao seu trabalho percebi o quanto eu gosto de design de interiores e pretendo fazer um curso, não tenho pretensão de ser como a Candice . Gostaria muito de um dia conhece-la pessoalmente , beijos a todos de sua equipe maravilhosa e um grande beijo para voce. Also, when I win the lottery and I mean “WHEN”….and I am planning to, before I announce it to anyone…including my husband, lawyer and the lottery officials….I will call HGTV and have their designers handle my first million(s) designing my dream home (s)….and so on…thanks for letting me have my dreams…. If I had the opportunity to pick a designer come and design my house, I would most likely only choose candice! I love her, she is so very talented… I have seen all her shows over and over again and now she has Candice Tells All Show, another great show! I think it was so sweet of Candice to re-do her Mother’s home before she moved into it! If ever I where lucky enough to win a lottery and buy a house, Candice would be the person to design every room in it! Not only does she make a room look simple and comfortable, but very Classy- looking, too! I dearly Love her funny personality, that is why watching her programs keeps you honed in on every detail of her designs! Sou brasileira e tenho acompanhado o programa Design Divine. Acho-0 maravilhoso.Você é demais! Gosto do seu estilo.Fino e aconchegante.Você e os membros de sua equipe são muito engraçados.Divirto-me bastante. Parabéns e como a Rosane disse:quem sabe um dia! I am searching for the retrofitted led light to insert into an existing 6″ socketed can light. I have searched every store and no one knows what I am talking about. This past weekend, Candice was demonstrating this product again on her show. It not only converts the old “yellowey” incandescent light to a bright, clean light, but also has a collar that surrounds the small led light, giving it a finished look. Candice has taught us the importance of good lighting…. help me find my solution! I don’t want to have to rip out my old fixtures ! Wish I knew! Sorry I can’t help. I love your tv show and your simple great designer…. unfortunatelly you’re not in Chile…from where I can take some ideas? My husband and I are recent empty nesters but we are caring for 3 parents. Our daughter lives nearby and we enjoy spending time with them, so moving to another city is not an option. My husband works out of town 3 to 4 days a week so his time home is important to us. There is always a lot to do and we try to grab a little time for us and time to keep up with friendships. Half of our house is upstairs which was the childrens’ rooms and game room. This leaves a rather small area downstairs for us and not so great for entertaining. We don’t want to move because we love our neighborhood. We live in Texas where trees are a premium and no new areas have trees and it is hot, hot , hot hear. We would like to make this house more to our liking but I am afraid of making a mistake and spending a lot of money and ending up with a mess. Frankly, it makes my head hurt to think about it. Candice Please help!!!!!!! Sincerely, a Texas girl with a Texas size Problem. I am Brazilian and not lose their divine design, I learned a lot and still learning to design. WHER IS KIM MYLES,ALSO THE WINNERS OF PREVIOUS DESIGN STARS #S 3,4, AND 5 ? WHAT HAPPENED TO CANDICE’S SIDE KICKS ? AND HOW DOES ONE FIND OUT THE ANSWERS? Hi Candice! I´m from Brazil and I just love your work!!! I´m building a house and I would love if I could have some advices from you. If I was rich enought I would bring you to my place in the south of Brazil. Thanks for sharing with us, simple mortals, your genius ! Candice me fascinan tus diseños y me gusta ver tus programas me gustaria saber donde conseguir en mexico o e.u. donde venden las plantillas para poner cuadros de fotografias en la pared, gracias. Sorry, I have no idea where she gets her jewelry. I absolutely LOVE Candice Olson, she is the best designer ever. Her style of decorating is to die for. I would love her to come and decorate my entire house. Hopefully my dream will come true one day and I will never leave my home again because I know she will make it so pretty that I will feel as I am on vacation all the time. LoVe Her!!!! My name is Edna , and I live in Brazil. I love your program. Me and my husband are building a new home, and sometimes I think how could be good if you can help us. Becouse sometimes we feel lost. Sorry about my english. She is the best designer EVER!!!!!! Hello, Candice! I live in southern Brazil (Rio Grande do Sul) and simply love your work and your team. Congratulations! SOY UNA GRAN ADMIRADORA TUYA, NO ME PIERDO NINGUNO DE TUS PROGRAMAS QUE PASAN AQUÍ EN MÉXICO A TRAVES DE DISCOVERY HOME AND HEALTH, ACABO DE COMPRAR UNA CASA Y QUISIERA QUE ALGÚN DÍA ME DIERAS CONSEJOS PARA DECORARLA CON EL TOQUE CHIC Y DIVINO QUE TU SIEMPRE LE PONES A TUS DISEÑOS. CANDICE, ERES UNA ENTRE UN MILLON. FELICIDADES. Candice your designs are just amazing!!! You are the best. Hola veo el programa siempre, me encanta como cada detalle es perfecto al finalizar, el diseño. I AM MOVING INTO A HOUSE BUILT IN THE 50’S THAT HAS A LOT OF ORIGINAL CHARACTER AND YOU ARE BY FAR MY FAVORITE DESIGNER AND I WATCH A TON OF HGTV. I HAVE NEVER SEEN A DESIGN OF YOURS THAT I DIDN’T FALL IN LOVE WITH , YOUR AMAZING. ANYWAY THIS VERY UNIQUE HOUSE STILL HAS TONS OF ORIGINAL FEATURES SUCH AS CABINETS , WRAP AROUND FIREPLACE THAT THEY HAVE UPDATED TO GAS , IT’S TRULY THE SWEETEST PART OF THE HOUSE NOT TO MENTION THE 4 STEP SUNK IN LIVING ROOM. I JUST HAVE ONE PROBLEM, I HAVE NEVER HAD TO TREAT A LARGE 3 DOOR SLIDER AND IT IS OFF THE DINNING ROOM. I’M NOT SURE WHAT WAY TO GO BECAUSE THE KITCHEN AND DINNING ROOM ARE SOME WHAT CONNECTED BUT YET SEPARATE AND THE KITCHEN ONLY HAS ONE UPDATE SINCE IT HAS BEEN BUILT AND THAT IS A NEW BLACK AND WHITE GLASS TILE BACK SPLASH, I AM GOING TO PUT VERY CONTEMPORARY HARDWARE ON THE ORIGINAL CABINETS AND I THINK THAT SHOULD BE JUST ENOUGH OF ADDING NEW TO THE OLD. WHAT TYPE OF CURTAINS SHOULD I USE FOR THIS EXTREMELY LARGE WINDOW . CAN’T FIGURE OUT IF I SHOULD GO OLD OR CONTEMPORARY . MY COLOR SCHEME IS BLACK MOSTLY WHITE AND POPS OF ROBIN EGG BLUE AND CHROME ACCESSORIES. DON’T NO COLOR , HOW TO MEASURE FOR SUCH A MASSIVE WINDOW. PLEASE HELP. AGAIN YOUR TALENT IS CRAZY AND I ENJOY WATCHING YOU CREATE . I LOVE LOVE LOVE YOUR DESIGNS. WISH YOU COULD DO MY ENTIRE HOUSE THAT WOULD BE A DREAM COME TRUE BUT I’LL HAVE TO BE SATISFIED WITH SOME ADVISE. PLEASE HELP. Judy, I’m afraid this is not Candice Olson’s website and the odds of her seeing your note are slim to none. There’s a link in the post above to hers if you want to try reaching her there! I agree with you ! She is the best ! Soy fan numero 1 de CANDICE OLSON, me encantan sus diseños que son realmente divinos,remodele mi apartamento con sus ideas, ojalá ella pudiera venir a Colombia.pero………… Cndice I love you work. It´s greaaaaaaaaaaaaaaat. Admiro muitíssimo seu trabalho! A cada programa que assisto fico mais encantada. Parabéns!!! Sorry, but this isn’t Candice Olson’s website. The odds of her seeing any of your comments are very slim. Sou apaixonada pelo programa Divine Designs, e grande admiradora de Candice e sua equipe. Assisto a todos os programas atraves do canal a cabo aqui em Porto Alegre,Brasil. Meus parabéns a candice e sua equipe. I am going to disagree with some of you guys. Candice is not one of the best designer there is. SHE IS THE BEST OF ALL ! Lov u Candice !